A pair of Schulich Leaders are making immediate impacts in their first year at the University of New Brunswick. 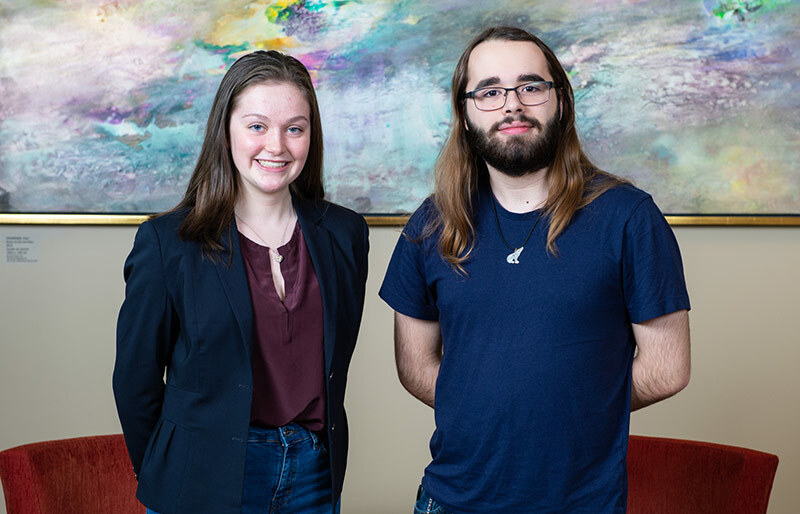 Geoffrey Noseworthy of Lewisporte, Nfld., and Anna Postill of Toronto received the prestigious scholarship, which is awarded to high school graduates enrolling in science, technology, engineering or mathematics, in part due to their leadership potential. Mr. Noseworthy, enrolled in a concurrent computer science and mathematical physics program, became the vice-president and director of alternatives in the Emerging Technologies UNB club, formed by another Schulich Leader at UNB – Wesley Finck. He is also playing a role in revitalizing the UNB Debate Club and is a member of the Physics Society and the E-Sports club. He created a podcast centered around university life, known as Unicast: The University Podcast! Ms. Postill is experiencing similar success in her first year of the university’s engineering program. Ms. Postill was elected onto the house committee in her residence as the social representative and joined Engineers Without Borders, a club that discusses issues specific to global engineering. Despite the hectic schedule, she also works with her online jewelry company - Be The Vibe Jewelry – which she formed with her sister, Gemma. Together, they make, market and sell handmade jewelry to raise money for rainwater harvesting systems in East African communities. This year, out of a pool of 350,000 potential Schulich Leaders candidates across Canada, 1,400 students were nominated, of which 50 received the award. Schulich Leader Scholarships are the largest STEM scholarships in Canada. “With 50 outstanding students selected each year, this group represents the best and brightest Canada has to offer,” says program founder Seymour Schulich. Mr. Schulich established a $100-million scholarship fund in 2012 to encourage the best and brightest students to become the next pioneers of global scientific research and innovation. The application deadline for the 2019 Schulich Leaders Scholarships is Jan. 30, 2019. Applicants must be nominated by their guidance counsellor. More information is available at UNB scholarships.